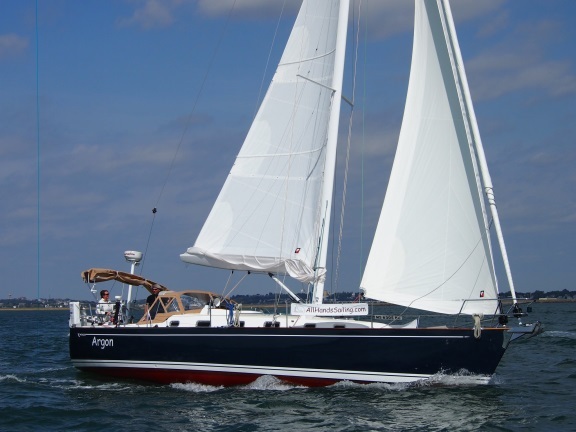 Argon, a 2014 Tartan 4000, was purchased as part of preparing to set off sailing on our first extended voyage (see the April blog post The Three Year Plan) and is entering her third summer sailing season. 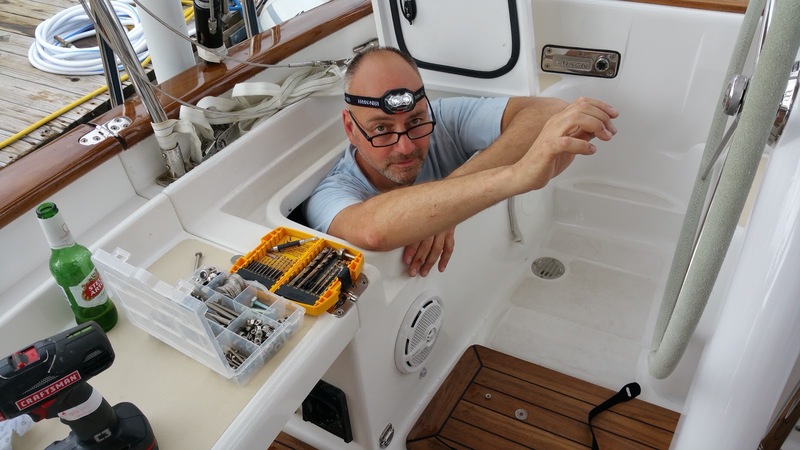 Many of our friends, both sailing and non-sailing, have commented that they are surprised (or confused) as to why we are always so busy with boat projects considering that Argon is a new sailboat. Sailboats (well, boats in general) always have endless project and maintenance lists, however, in addition to the standard items, we have been busy converting Argon from a fantastic coastal cruising sailboat to a vessel suitable for the open ocean and extended cruising as we prepare to leave for a year or so excursion. Our sketched out itinerary includes at least several multi day open ocean legs sailing short handed (just the two of us) including Boston to Nova Scotia (July), Newport or Norfolk to Bermuda (October) and Bermuda to ~Antigua in the Caribbean (November) hence we will often be many days away from land and, when island hoping, will have unpredictable access to retail boat parts and marinas. We plan to anchor the majority of time in harbors and will be off the grid for long periods of time. We endeavor to do projects ourselves but have employed professionals for a couple of the more thorny ones. In addition to keeping tabs on the sparse traffic while short handed in the open ocean, AIS has proven a helpful add on for coastal cruising during overnight legs and bad weather. We also find AIS helpful while informally racing to keep tabs on our competitor's speed and bearing to anticipate wind shifts. AIS is important off-shore to keep watch for traffic, especially large commercial vessels at night or during storms and poor visibility. 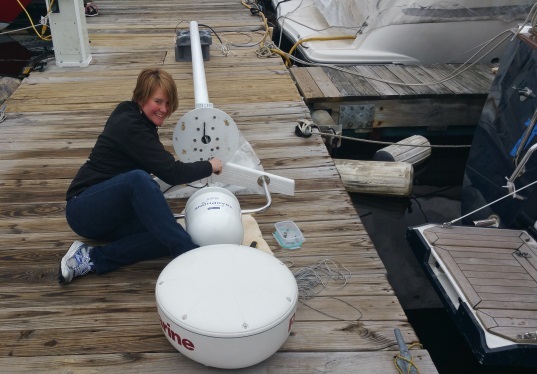 For weather downloads and communications - We went with a compact KVH Fleet 1 satellite system for data / phone through Cay Electronics in Portsmouth, RI. The dome is mounted on a custom bracket designed and manufactured by Edson to the unique specifications for mounting on the transom mast. The system worked perfectly and was very easy to configure. The data is very pricey and so this is only used for critical communications off-shore. The $50/month subscription gets you a whopping 10MB (yes, M, not G), with additional data costing $0.50/MB. This is plenty to download a few GRIB files and basic text email and SMS with people ashore. Hall Spars and Rigging installed a track on the mast for the storm trisail sail and North manufactured the sail. We will certainly practice in good weather so that if / when the crap hits the fan, we will be ready. We will attach ourselves to jack lines during rough weather or big seas to ensure we do not get thrown off the the boat. There has been controversy recently as to whether jack lines should run outboard along the sides of the deck or more inboard along the cabin top. We opted for the traditional configuration to be used with dual attachment tethers. A couple of added pad eyes in the cockpit enable easy attachment while at the helm. For port and starboard settees. One can never have enough charts - We have many handed down from other sailors who have finished cruising long distance and we have purchased many new ones. New chips for the GPS were also secured to cover our expected range. This was a fantastic experience well worth the two days time and cost this past March. One day was packed full of safety related topics such as off-shore communications, heavy weather issues, crew preparations, crew overboard, etc. 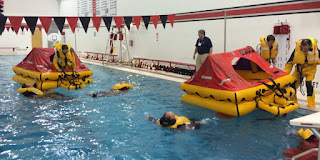 and the second day was hands on including pool time with PFDs and liferafts, practicing with flares and fire extinguishers on the beach, and damage control practice in a USCG simulation trailer. The USCG had a damage control trailer to simulate a vessel taking on water and provide practice with various ways to control the flooding; it was quite stressful but incredibly helpful! To be thrown in the case of a crew overboard situation to mark where they are to aid in retrieval. We've had mixed success with this device so far. 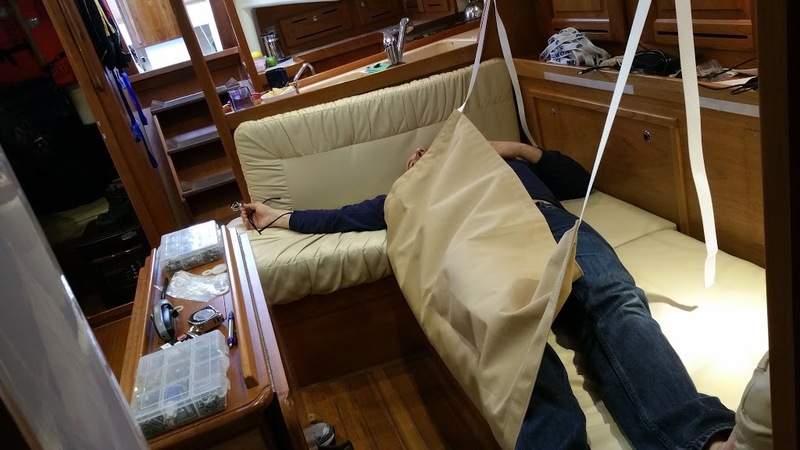 We have not needed it (yet) but it has already once spontaneously inflated in the cockpit while sailing. We may be swapping this out for a MOM device. 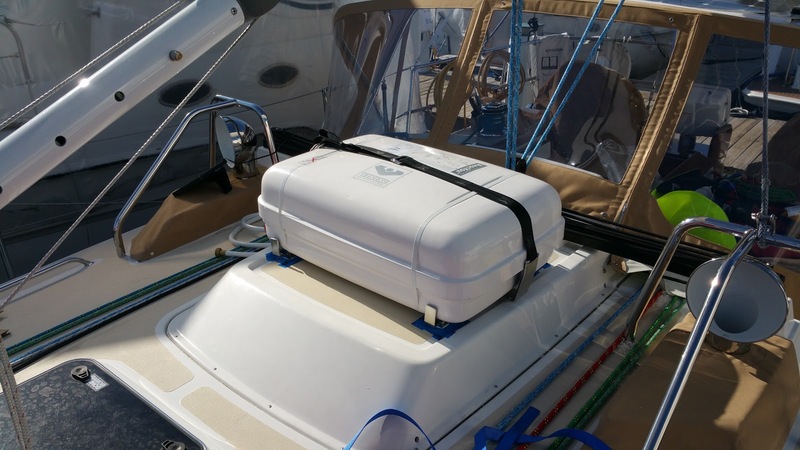 Boat manufactures are required to equip vessels with automatic and manual bilge pumps.They tend to do the minimum, especially with regards to the manual pump. Tartan equipped Argon with a Whale brand plastic handle pump. We wanted to see if this very weak looking pump would keep up with an ingress of water. We poured 55 gallons of water in to the bilge and marked lines every 15 gallons (with nail polish). We worked the manual pump for a while and managed to get through about only half the water after quite a bit of effort. If we were taking on water at even just a moderate rate and lost our electric bilge pump, there is no way this pump would ever keep up. Check out the video we made of this experiment. We drained the second half with the electric pump. The video above shows our testing of the standard manual bilge pump that came with Argon. After this test, we quickly decided to upgrade to a much better pump. We decided on an 18gpm pump through Edson. Stanley Boat Yard installed this pump under the port side coaming. This pump is a beast compared to the former Whale! (No video yet) . 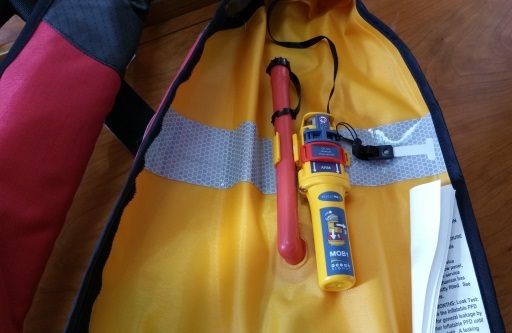 We have secured Automatic Identification System (AIS) beacons to our inflatable life vests. 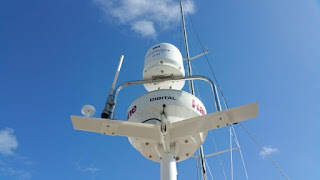 These AIS beacons will send a "DSC" signal to not only Argon but also other nearby vessels to aid in locating the crew overboard. Of course we hope to never need these. The DCS alarm on most modern VHF radios will wake the dead. We've heard ours go off once when a nearby cruise ship lost someone overboard near Gloucester. 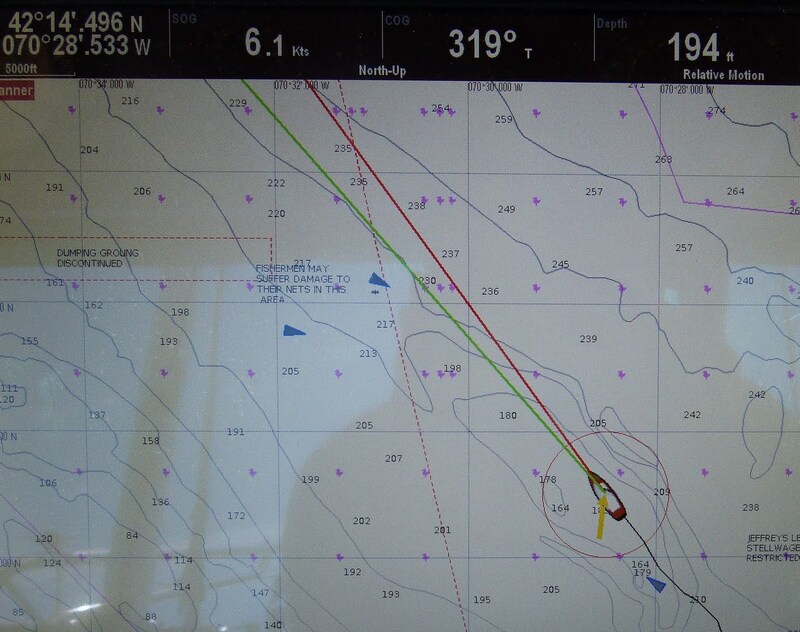 For boats so equipped, it will also show the position of the victim on the chartplotter. The four person Plastimo life raft that used to be stored in the bottom of a sail locker (difficult to deploy) was replaced with a six person Viking in a hard case deck mounted; an enhanced "ditch bag" was assembled as well. This included a handheld VHS with DSC (digital select calling), extra batteries, sea-sickness pills, basic medical kit, reading glasses, an EPIRB and a secondary PLB. In the event of dismasting (very bad), this will keep the lower part of mast from flailing below deck causing even more damage or injuring someone. This is not the cute little pouch from West Marine with some band aids and gauze, but a fairly robust set of equipment that may be needed given the amount of time we will be out of reach of medical care for extended periods. The kit includes a variety of medications such as steroids, sea sickness medicines, antibiotics, etc. Resulting in vaccinations or medicines for Hepatitis A, tetanus, Yellow Fever, Typhoid, Malaria. And some preventative measure counseling. Our primary anchor is 35 lb Delta on a windlass with 120 feet of 3/8 inch chain and 200 feet of rhode. We secured a 15 lb Fortress anchor which will be our reserve. We also put together a new rode with some 5/16 inch chain and some 7/8 inch nylon line (the latter will double as our drogue rhode). 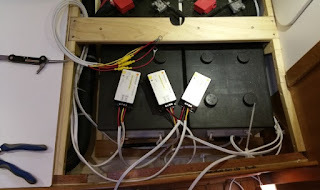 This spare ground tackle is whimpy compared to our primary setup, but will hopefully do the trick as a secondary/backup. A drogue is a sea anchor... to be used in stormy seas when we need to slow the vessel down. We went with a Shark Drogue by Fiorentino. The drogue can also be used as a steering device should there be damage to the rudder (in fact practicing this technique is a requirement for NBRSR). 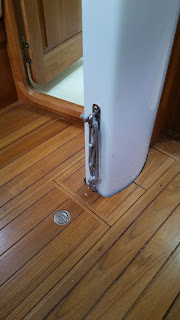 We've reworked our secondary anchor rhode to double as the rhode for the drogue. We also replaced our tiny danforth dinghy anchor with a 15 lb mushroom which will double as the sinking weight for the drogue. As with the storm trisail, we will be practicing using the drogue in the coming weeks before our first off-shore trip. We sold our home and became live-aboards more than a year ago as part of our logistical and emotional preparations for extended cruising. The following items have proven important or at least convenient given Argon will continue to be our home for quite a while longer and we will often be anchored in remote locations. 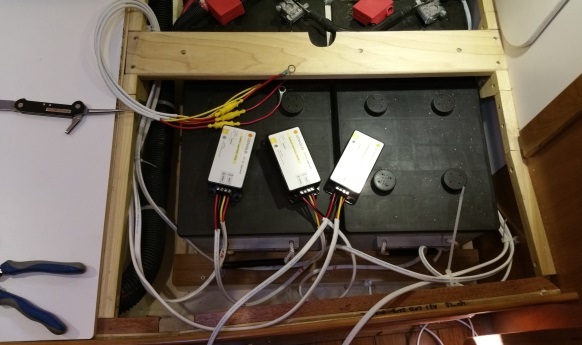 We opted for three flexible panels made by Solbian purchased through Cay Electronics (2 x 100W and 1 x 137W) with individual Genesun controllers. 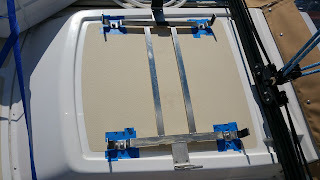 Kinder Industries fashioned zipper attachments and covers for UV protection for the wires for the bimini and dodger . Two 100W solar panels lay atop the bimini and one 137W panel is secured to the dodger. Bob has unplugged from shore power many days to test out the solar panels which have kept up nicely with his high powered work laptop and the refrigerator nicely. Thus far in our northern latitude, we have seen 220 Watt output from the system. All internal and external lighting has been converted to LED. Some of the lights were LED as standard but we were surprised this was not throughout. Cockpit, anchor, and various internal lights were upgraded. We also went with a tricolor LED masthead light to serve as redundant navigation lights. This makes a huge difference in energy consumption. We purchased a new nine foot AB dinghy with an aluminum V bottom and a Tohatsu 6hp outboard last year. 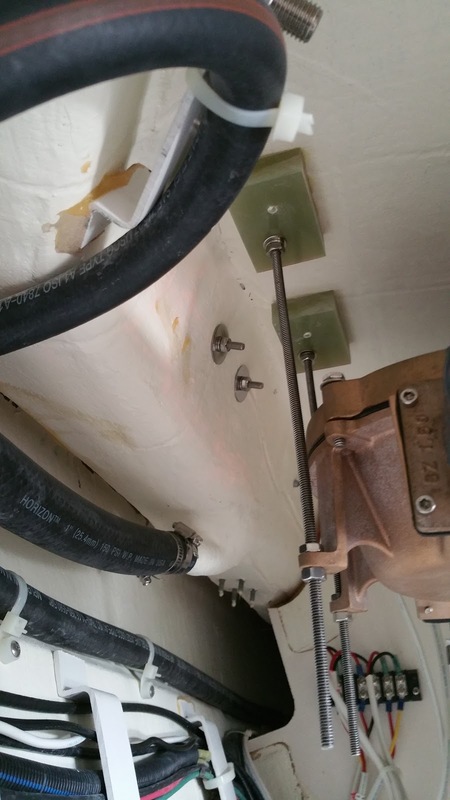 The davit installation project was featured in a blog post last year. We have been very happy with our custom Kato davits. More recently we practiced mounting the outboard on a rail mount homemade by Bob and rigged a lifting sling to enable hoisting of the dinghy on to the fore deck which is needed for off-shore passages. These replace the very attractive teak ones but are much more practical / easy to slide in and store and the visibility a plus. 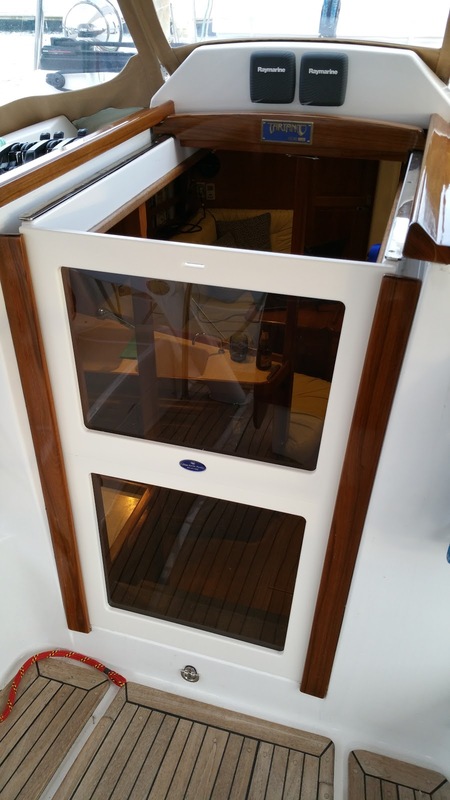 These were custom fabricated by Custom Marine Plastics in Bristol, RI. Custom hatchboards - We never have these in while sailing along the coast. However, when off shore, we will often have one or both secured in place to keep water from getting down below in the cabin when we take on large waves in the cockpit. Lots of stocking up on spare parts (e.g. 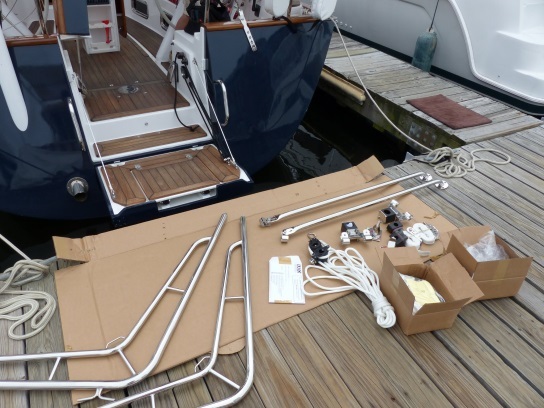 macerator pump, bilge pump, fresh water pump, filters, belts, blocks, shackles, tons of fasteners and hardware, etc.). Basically, everything that's broken has been replaced with two items: the one that broke and an extra for next time it breaks. Where possible, we try to eliminate the root cause of the breakage. See the former blog post Water, water everywhere. With so many parts and equipment, we endeavor to stay organized. In addition to many labeled containers that are stored behind the settees and in cabinets, there is a chart to label the contents of many of the more hidden spaces. The bins as of a few months ago. There's more now. A few more features are mainly to just help us be more comfortable. Full canvas cockpit enclosure: Fabricated by Kinder Industries for cold weather sailing and for general living aboard while docked in the cool spring in Boston. The panels are easy to remove and store as it will quickly become a sauna as the temperatures inch up. Internet: Unlocked hotspot with WorldSIM SIM card; bullet WiFi router on radar mast. 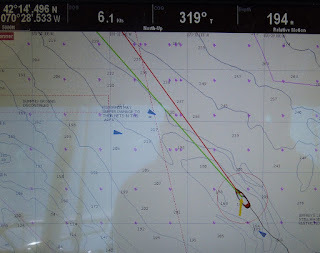 Bob is working 25% during the voyage and needs decent connectivity for data and voice. We will certainly try to hijack any free wifi we can find (perhaps when anchoring near a resort or other civilization), but the unlocked Alcatel hotspot will probably be the primary connectivity. The data on the World SIM card is pricey and varies depending on which country you are in. They partner with local carriers in 180 countries (the whole Carribean for sure). Because the hotspot is unlocked, we're also free to plug in any locally purchased pre-paid chip (if we find something cheaper than worldsim's data). Storm jib: After consulting with North Sails, we believe a double reefed main or the storm trisail (mentioned above) and the ability to unfurl just a wee bit of the jib will provide appropriate sail plan options in heavy weather. 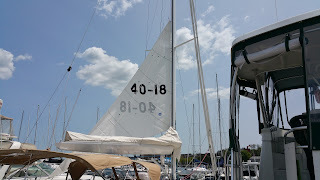 We considered getting a "gale sail" that slips over an existing furled headsail, but our self-tacking jib has a very large clew-board (where the line attaches) and it probably would not work. Single Side Band (SSB) radio: The communication satellite was chosen instead but we also purchased a simple SSB receiver so we can listen in on conversations as another source of information. Water maker: It will be interesting to see how we manage filling our water tanks with the jerry jugs when dock side drinkable water is difficult to come by. Time will tell if it was the right choice to forego a water maker. Argon's carbon fiber "pocket" boom is also a pretty good water collector (as our passengers find out when we hoist the main after a good rain). We will definitely be collecting as much rain water in the Carribean as possible. Windvane: Although common for off shore boats to aid in steering over long distances, we are opting to use a combination of our autopilot and human power. Wind generator: We are fairly confident that with smart monitoring of energy usage and our efficient solar panels, we will have sufficient electricity so we opted not to also secure a wind generator. As our departure date nears, there will surely be additional projects - there always are on boats. But the above represents most of what we need to have in place for our big adventure. In addition, my last day of work looms near which also means my final paycheck. And Bob's 25% work schedule will start soon afterwards. Therefore it is a good thing that the money outflow will be easing up. Lastly and importantly, one can have an ideal boat tricked out with all sorts of equipment, but good seamanship, judgment and situational awareness will reign supreme in keeping a vessel and crew safe and comfortable and getting us on to the next port. Flexible and fun sailing charters in Boston, Newport and beyond.